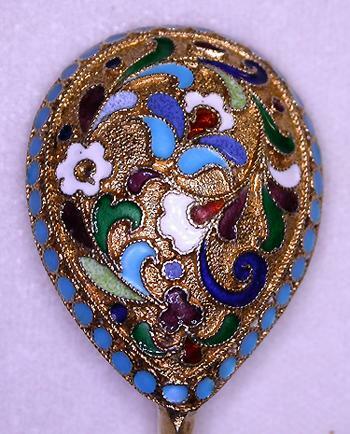 Russian gilded silver and enamel salt spoon, by Gustav Klingert, Moscow, late 19th century. The bowl is worked in a foliate design within a band of turquoise enamel pellets against a stipple gilded ground. The handle contains a geometric cobalt and turquoise enamel motif which terminates in an enameled crown shape finial. Marked with the 84 silver standard. Length: 3 �".